As the last two fertile male northern white rhinos in the world, Suni and Sudan have a lot of pressure on their broad shoulders. 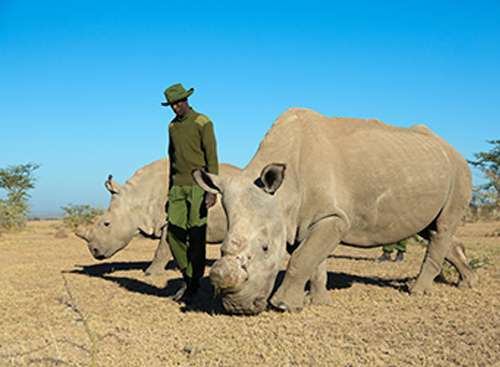 On 20 December 2009, Suni and Sudan (along with two female northern white rhinos, Najin and Fatu) were translocated from Dvůr Králové Zoo in the Czech Republic to Ol Pejeta Conservancy in Laikipia, Kenya. 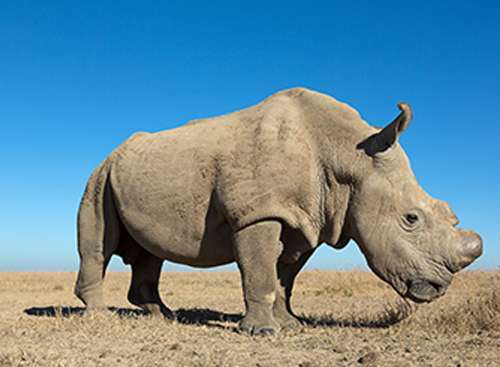 Fauna & Flora International (FFI) was a key instigator and primary funder of this last bid effort to save the subspecies from extinction, having raised 80% of the funds required to move and re-establish the rhinos in Africa. The northern white rhino is probably extinct in the wild (DRC and South Sudan) and captive breeding attempts had been futile. It was anticipated that the wild environment, climate and rich grasslands of Ol Pejeta would provide the rhinos with more favourable breeding conditions. After initial matings were recorded in 2010 and 2011, expectations were raised further when Suni was seen mating with Najin in 2012. But unfortunately no full-term pregnancies or births have resulted thus far. As part of the agreed breeding strategy, new breeding combinations are now being tried. This month a male southern white rhino will be introduced to the two northern white females, with the objective of getting them pregnant at the earliest opportunity. The hope is that the two females can produce several offspring by 'inter-crossing' the subspecies in this way. Although these animals will not be pure-bred northern white rhino, they will be conserving the important genes locally adapted for the habitats that the northern white rhino evolved within. There is future potential for these inter-crossed offspring to be bred back with pure northern whites, thereby increasing the proportion of these genes in future generations while maintaining a genetically healthy white rhino population. Preparations are underway for the January introduction, with the two northern white females having been separated from their male counterparts. A fine and fertile adult male southern white has been selected from neighbouring Lewa Wildlife Conservancy, and will be introduced into the females' enclosure. An equivalent breeding strategy is also being implemented for the northern white males, with southern white females.